Slice star fruit (trimming the brown rind on the star points) and save a few slices for garnish. Throw the rest into a blender with the rest of the ingredients and mix together. Pour into martini glasses and enjoy. Love her or hate her, one thing is for sure — Kim Kardashian knows how to put on a show. Call me crazy, but I'm pretty sure this is going to be the case with her two-part wedding event, "Kim's Fairytale Wedding," beginning this Sunday on E! Entertainment. In fact, I'd put money on it. Touted as the "American Royal Wedding," millions will be tuned in for four hours to see TV's three best-dressed drama queens and their drama mama scream, squeal and fight to get Kimmy and the 20.5 carat boulder on her finger to the alter. Admittedly, I haven't really kept up with the Kardashians, but I'm always one to raise a glass in the name of love. So my gift to the new Mrs. Humphries is a cocktail to call her own, The Kimmy Cocktail. Having recently become their new spokeswoman, I thought it fitting that Midori be included in the mix. I also wanted to add a little star power, and what better way than with star fruit? Though it looks rather intimidating (like a lot of Hollywood celebrities), Star Fruit is really easy to work with (unlike a lot of Hollywood celebrities). When choosing, make sure you find one that is more on the yellow side. Similar to bananas, the greener it is the less ripe it will be. Wash to ensure it's clean and then cut both ends of the fruit. Cut the remaining fruit into quarter inch slices. Remove seeds and carefully trim the brown edging on the star points. Your star fruit is now ready for its close up. Putting aside a few slices for garnish, throw the rest into the blender along with one kiwi fruit (peeled and chopped), 2 ounces of Midori, 3 ounces of rum, 6 ounces of pineapple juice and one cup of ice. Mix in blender for a few minutes and then pour into a martini glass. 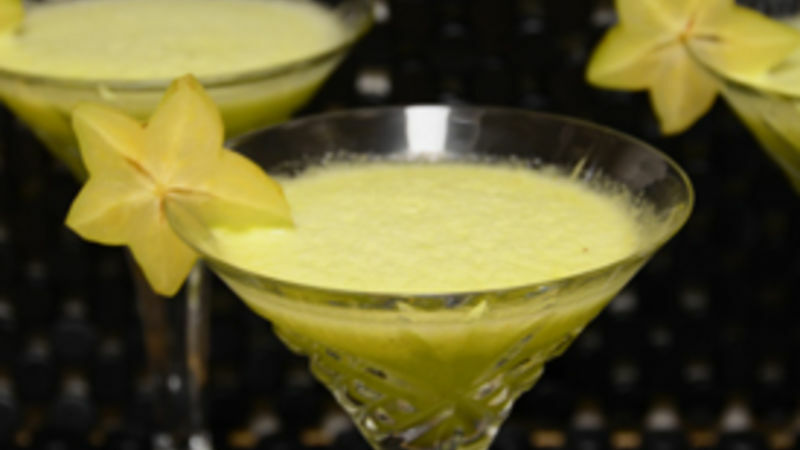 Don your star fruit on the rim, raise your glass to the newlyweds and enjoy!